Taking down your trousers 😉 sfw! 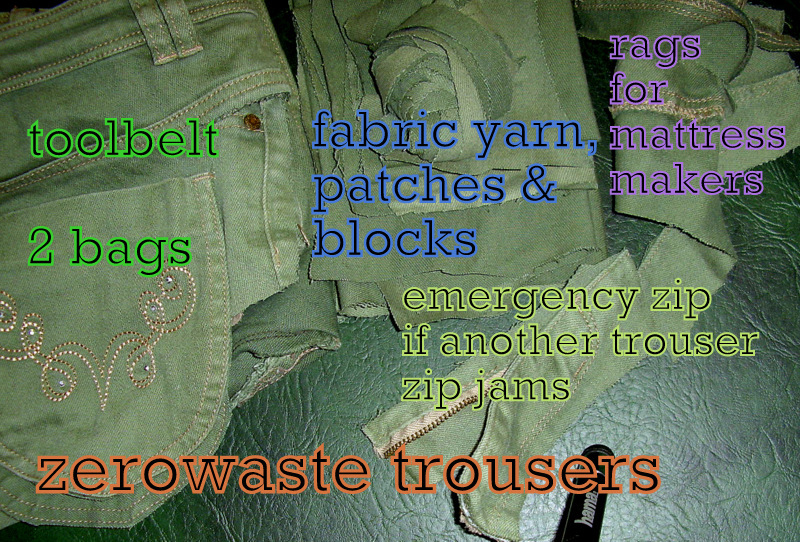 How to upcycle a pair of trousers depends a lot on the fabric involved – this tutorial is for jeans, heavy chinos/dockers, heavyweight cotton drill/ camouflage trousers. So, my gardening trousers are about 7 years old and have progressed from smart casual to allotment wear and according to the paint splashes, DIY or art 😉 They could carry on this way, but the crotch will need patching soon and to me it makes more sense to make them into new things while they still look mainly ok and have a lot of wear left, than to leave them till they are half rags and have to go to end life as ground up fibres in mattresses or those wipes. 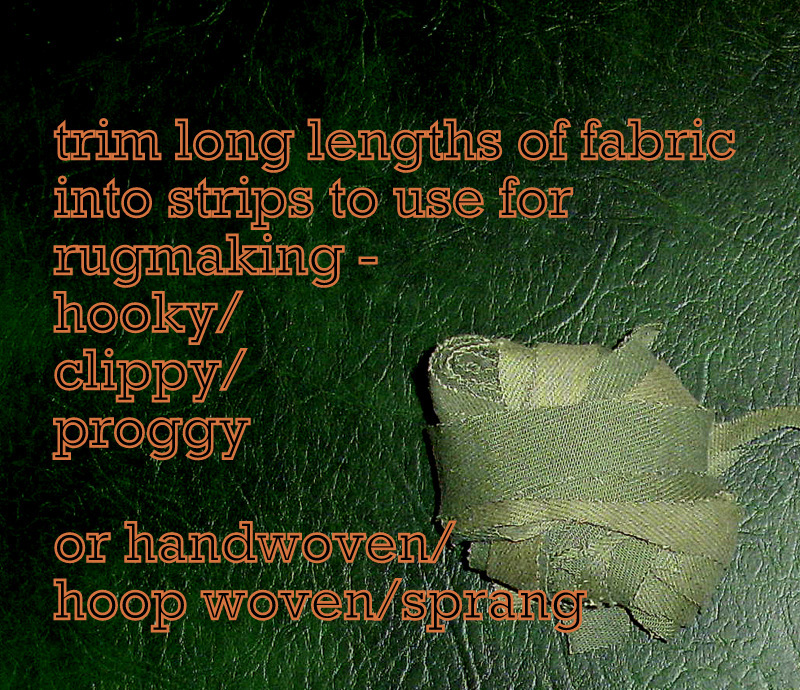 There is a way to deconstruct a garment to get the most use and least waste out of it. It starts by recognizing your own skill set and needs – this tutorial includes some NO-SEW and FIXER-FRIENDLY projects, because it’s zero waste week, but a prom dress can be upcycled too, just veeeerry differently 😉 and would probably be best suited to someone with good sewing skills or an artist/crafter who liked tearing things. 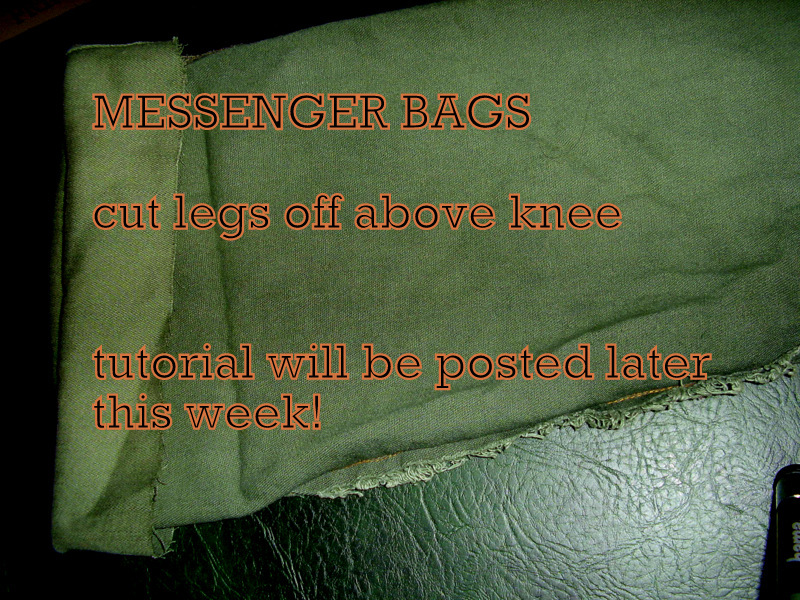 TOOL BELT, 2 MESSENGER BAGS, FABRIC FOR PROJECTS AND STASH, EMERGENCY ZIP AND 1 LARGE HANDFUL TO RAG RECYCLING. 100% RE-USED. 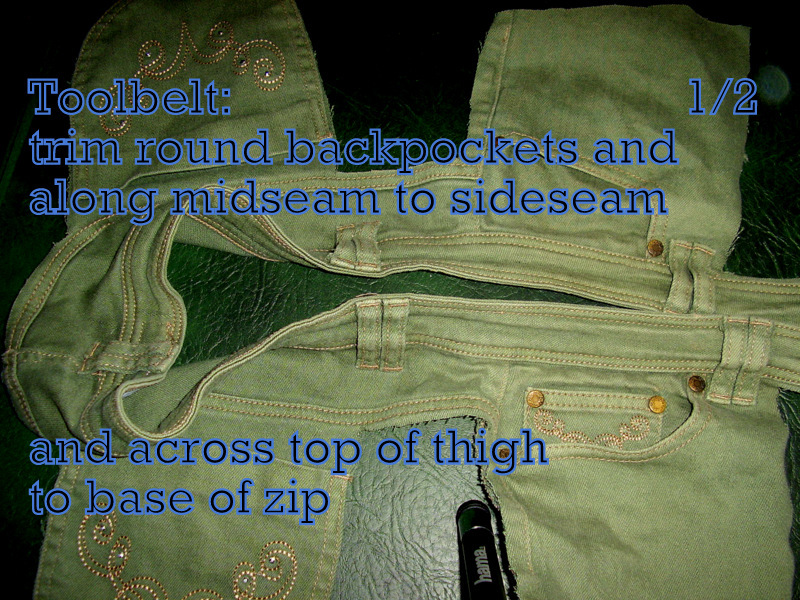 Toolbelt; I was taught this by a friend who volunteered at Nottingham Free Shop. All you need are good/sharp scissors. Basically, you keep the belt and pockets of the trousers and cut away the rest. 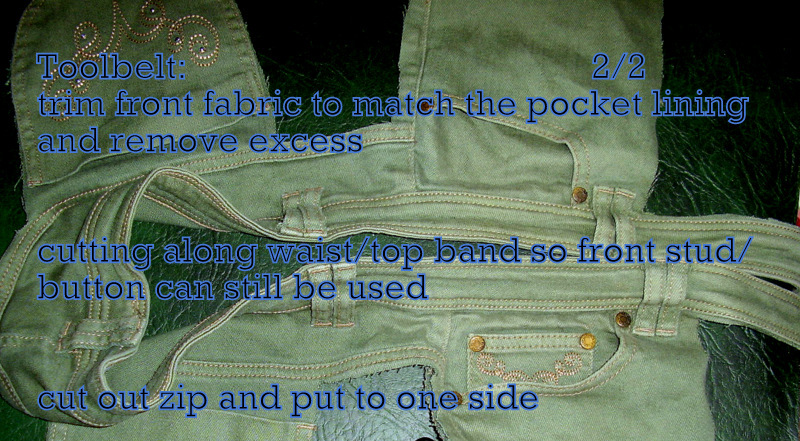 It depends on the cut of the jeans, but even low slung hipsters can be used for this, but you might have to use leg fabric for adding (false fronting) the pockets. I’ve discovered that trousers without pockets are beyond annoying with the rollator – I need to not be scrabbling in my bag for bus fares etc and it’s been far too hot for a jacket, so this will come in very handy next summer to wear over light trousers that won’t take pockets without tearing. Lailah added all sorts of custom pockets and clippies to her belt to go round the festivals – you need to know where your lighter is and that it’s dry, if camping in the woods a multi-tool knife is best kept handy, and the belt loops are great for that. You could add buttoned tabs for mallets or a hammer, secateurs can go in the pockets, whatever you like really. 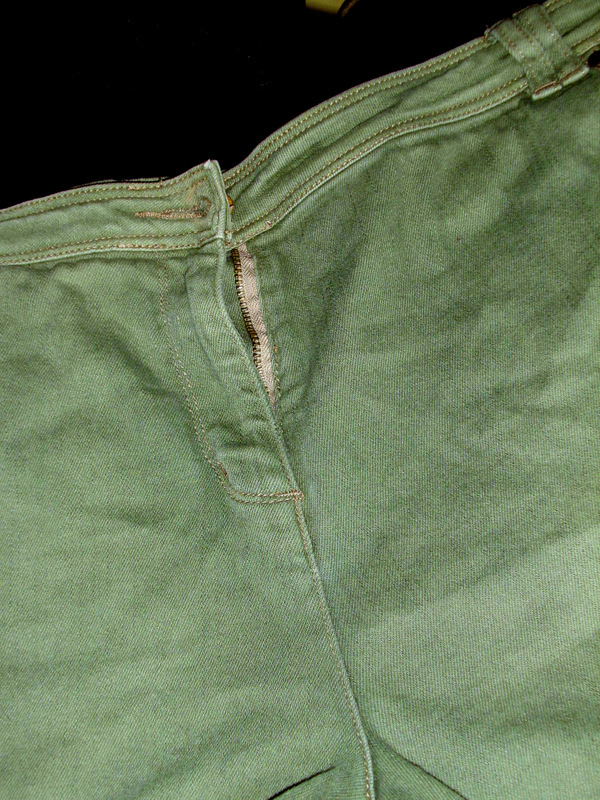 I will machine stitch the front pocket fabric to the lining because it annoys me when I see the lining sticking out, AND it makes it far stronger – form AND function 😉 So now you have two legs and a zip and the crotch which is the bit, that with any side seams I send to the rags – but remember, NO STUDS, NO METAL, nothing that could wreck the machine that ‘grinds’ the fabric into rags!! 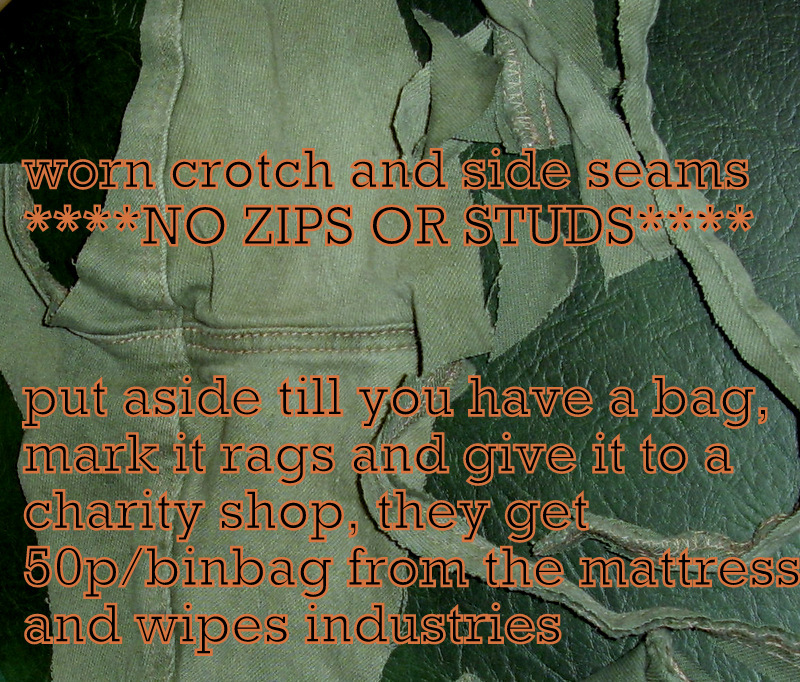 Take the chance to notice how differently the inside wears from the outside when garments are worn outdoors a lot. In the 18th and 19th centuries, garments were turned inside out after a couple of seasons to ‘freshen’ them, particularly if they were in colours that were expensive to dye. There’s a great section in Louisa May Alcott’s ‘An Old Fashioned Girl’ where the country girl teaches her rich friend, who has fallen on hard times, to make over her clothes. I photocopied it as part of my display for the end show of the Eco-Garments course I took with the amazingly inspiring Linda Lloyd Willis. 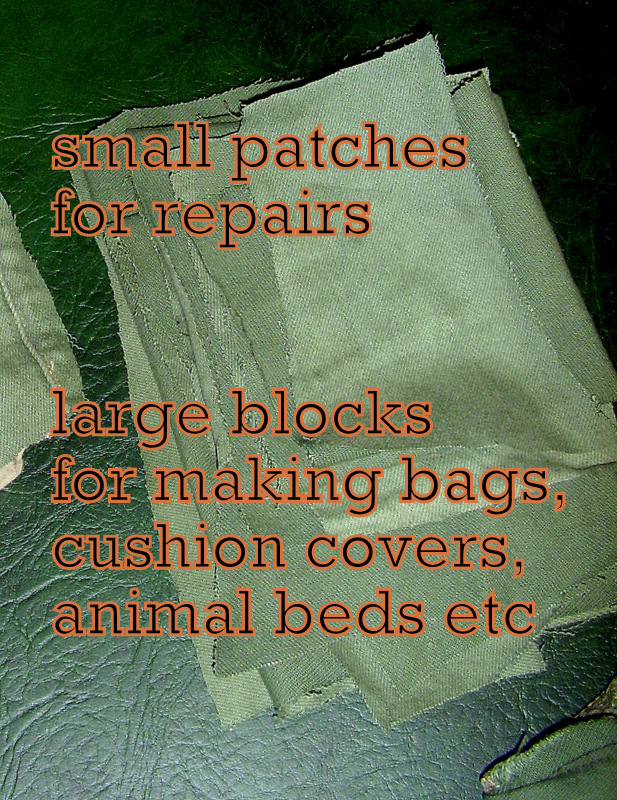 I’ve been making cloth carriers to sell at Nottingham Fixers stall and this fabric would be fine for that, large simple blocks for the body and you could use contrasting thread and an automatic stitch pattern on your sewing machine to make a feature edge and pocket. Love the toolbelt idea, but I’m so light on my clothes that it’s the pockets that go first. « zero waste week 2013: darn it!